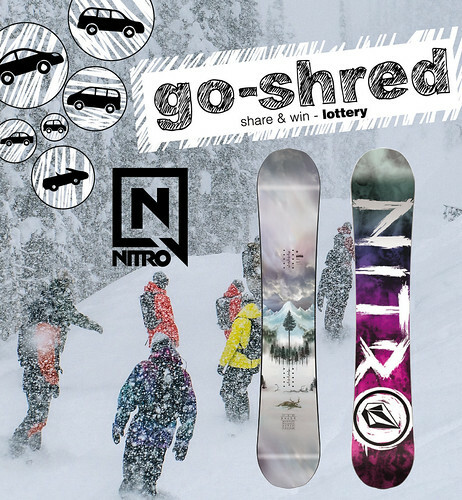 Unsere go-shred lottery mit NITRO ist vorbei und wir haben einen glücklichen Gewinner ausgelost! Der Gewinner des NITRO Snowboards ist IVAN PCHELIN!! Bei der nächsten go-shred lottery kannst du Stuff von VANS gewinnen, also keep SHARING and WIN !!! Alle Infos zu den Teilnahmebedingungen der go-shred lottery wird bald auf unserem Blog erscheinen. Also halte dich auf dem Laufenden. Our go-shred lottery with NITRO has come to an end and we found a lucky winner! The winner of the NITRO snowboard is IVAN PCHELIN !! Congratulations! The next go-shred lottery will be with VANS, so you guys can be exited about that, it's gonna be lit. All Info about how you can participate in the go-shred lottery will be on our blog soon! So keep yourself updatet.